Whirlpool Bathtub Conversion - Macomb, Shelby, Clinton Twp., & More! 1/4 Mile East of Hayes Rd. North Side of Hall Rd. Receive valuable information and coupons. No strings attached! We will never share your personal information. Just Choose Your Color and How Many Jets You Want. 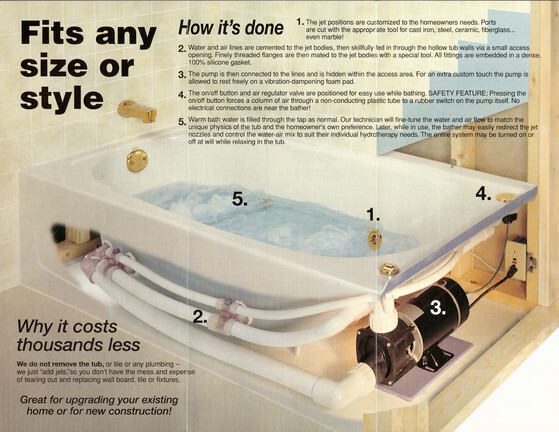 Our experienced installation crew will custom-fit a spa-quality jet system best suited for your style of tub. Because we do not remove the tub or tile, installation can be completed in one day. This means that you can avoid the mess, inconvenience, and expense of an extensive bathroom remodel. 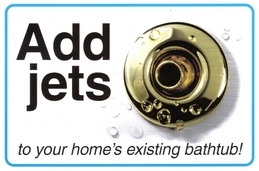 GREAT FOR UPGRADING YOUR EXISTING HOME OR NEW CONSTRUCTION!